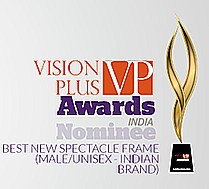 Leading Ones In The Category Of The Best New Spectacles Frame (Male/Unisex – Indian Brand). Choose The Best One! We bring to you the VP Awards Nominees. Read on to know more on what makes these products extraordinary. Vote For Best New Spectacles Frame (Male/Unisex – Indian Brand) category and make your Vote count! visit vp-awards.com and vote now! 1. Arcadio SP232BK : If you like this product then vote now! ARCADIO has been enthralling quality-seekers with a fascinating range of unisex spectacle frames. The brand has always laid utmost emphasis on offering breathtakingly refreshing designs and colors guaranteed to give a charming facelift to the wearer, in such a way that for every fraction of life there is ARCADIO, be it enriching elegance at work, alluring magnetism for romance or vibrant depiction for play. Every ARCADIO eyewear is crafted with impeccable finesse and precision to make it strikingly distinct. The passion and soul that goes behind the making of an ARCADIO is almost tangible which makes every ARCADIO truly a masterpiece.This entry has been nominated by:Aimz Spectrum Pvt Ltd. So what are you waiting for… Vote Now ! 2. Augustino Gold Small DIA T/P : If you like this product then vote now! Augustino gold frames are lightweight, and made of pure, solid and hallmarked gold. The frames are available in variations like rimless, half-rimmed and full-rimmed, while a few models showcase embellished diamonds. Depending upon amount of gold used, the rimless frames weigh around 10-13 gms, the half-rimmed frames weigh 14-18 gms and the full-rimmed frames weigh 18-25 gms. These frames also double-up as an investment option, and can be sold at a later date if required, based on the gold prices. Mr Jayraj explains, “Normal frames become redundant after wearing a few times, and need to be thrown away, but Augustino frames are an investment, one with very strong returns.” This entry has been nominated by Balaji Exim. So what are you waiting for… Vote Now ! 3. John Jacobs N1122 : If you like this product then vote now! John Jacob’s frames reflect quality, precision and substantive fashion. The shapes are classic with a controlled use of colour and use of premium materials like titanium and high grade acetate. There is no use of plastic in the John Jacobs frames. John Jacob’s is a brand that makes ambition fashionable, a brand that celebrates ambition as the new fashion statement. Titanium- For those looking for durability. A unique blend of strength and lightness. High strength, still ultra light weight and flexible. Priced between 2000 and 3000 Rs. Association with aerospace, automobiles leading to an imagery of premiumness, sophistication and finesse. This entry has been nominated by Valyoo Technologies Pvt Ltd. So what are you waiting for… Vote Now ! 4. O2 MOD-254 : If you like this product then vote now! This Optical Frame comes with a classic full Rim design. The temples are finely crafted with colourful prints for an elegant touch. This full Rim optical frames with a simple yet stylish design is ideal for men. This entry has been nominated by Ganko Opticians. So what are you waiting for… Vote Now ! 5. O2 MOD-235: If you like this product then vote now! These trendy spectacles comes with a pair of uniquely designed temples. These spectacle appeal to youngsters at once.This entry has been nominated by Ganko Opticians. So what are you waiting for…Vote Now !